Mobile banking (also known as M-Banking, mbanking, SMS Banking) is a term used for performing balance checks, account transactions, payments, credit applications and other banking transactions through a mobile device such as a mobile phone or Personal Digital Assistant (PDA). 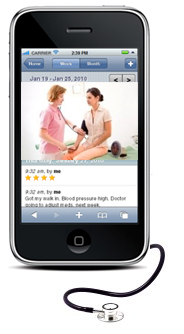 The company offers Independent remote & mobile health monitoring services. We offer a comprehensive platform of innovative patient technologies and services that help physicians detect and analyze symptoms before they become major health problems. We enable physicians to establish stronger connections with at-risk patients and provide better guidance to patients. The wireless medical system can digitally collect, store, transmit unify. share, and monitor vital signs from the patients and is shared with physicians and Hospital information management system.